When you work about Database today, you may work with Data Warehousing, and Oracle Warehouse Builder is a powerful tool for building it. What is Oracle Warehouse Builder(OWB)? OWB is a data warehousing-centered data modeling and data integration solution. On OWB 11gR2 is pre-installed with Oracle Database 11gR2. You will see 2 users in Database. It can be installed and used on Oracle Database 10gR2 and 11gR1. You can check Oracle Warehouse Builder: Feature Groups and Licensing. However, You are looking some books about Oracle Warehouse Builder, Don't miss "Oracle Warehouse Builder 11gR2: Getting Started 2011" book, written by Bob Griesemer, who has over 27 years of software and database engineering/DBA experience in both government and industry, solving database problems, designing and loading data warehouses, developing code, leading teams of developers, and satisfying customers. You will start with the installation of the Oracle Database and Warehouse Builder software, You will learn the analysis of source data, designing a data warehouse, and extracting, transforming, and loading data from the source system into the data warehouse. You will see many samples and pictures. This book will teach you step-by-step and help you easy-to-understand about Oracle Warehouse builder. This book has 10 chapters. When you start with this book. You will learn from good samples (real system in the world). It'll helpful, if you follow software required before start it (just suggest). Each chapters, which shows good layout, pictures and steps. Who can read this book? Sure... If you are beginner with Oracle Warehouse Builder, This book will help you with installation, configuration, architecture, etc... 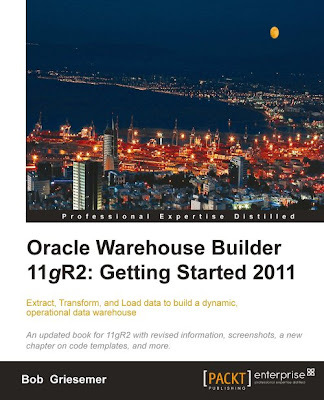 If you are immediate reader with Oracle Warehouse Builder, This book will teach you from good samples. However, you can learn more and more... from this book. Because You will get idea for designing the Target Structure(Data warehouse design, Dimensional design and ..), ETL, Using more with OWB(validating,generating,deploying and executing objects) and Extra Features. When you read this book finish, You will understand Data Warehousing and be able to use Oracle Warehouse Builder.